As winter takes hold of the Virginia Beach, VA area, hordes of people are flocking to the movie theaters for some cozy entertainment. Let’s not ignore, though, the downfalls to the traditional movie theater. Don’t we all hate having to arrive a half an hour early just to get a decent seat? And there’s no guarantee that kids won’t throw popcorn at you from the row behind. That’s why movie lovers might consider a professional home theater installation this year for their Coastal Virginia homes. Don’t you want to watch movies your way, with minimal outside noise, while wearing whatever you choose? Keep reading to see which home theater trends inspire homeowners this year, then let us know which ones you’re most excited to see in your home! Most home theaters we’ve seen up to this point have favored traditional, single-person theater seating just like what you’d find at the movies. But close families found those setups a little stilted, so sofas and loveseats work better for those who want to enjoy more intimate movie experiences. Beanbags and other casual seating have emerged in modern home theaters. Use your sense of style to create more laid-back, family-friendly spaces. To further reinforce this communal vibe, home theatres are taking on a fused, media room experience. This trend, which often involves multi-screen media and theater rooms, counteracts the “bigger is better” attitude about screen size and emphasizes instead, “more is better.” If you want to watch two games at one time, your two (or more!) screens can give you that sports bar setup. Similarly, if one family member wants to play video games while the other watches the game, the family still enjoys time together in the same room. Have you considered adding a projector to the mix for watching movies? We can install a retractable screen that disappears into the ceiling and appears when you need it. 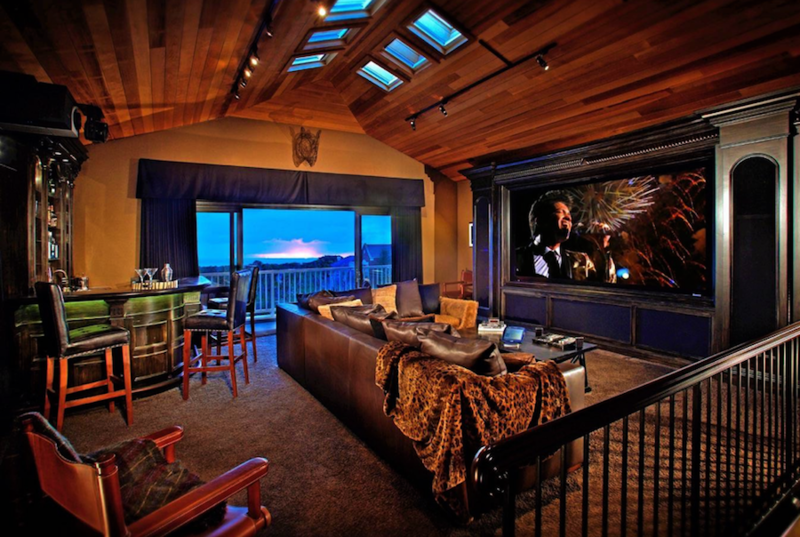 Today’s home theater rooms and media rooms let you have whatever technology you want in one space. Due to Amazon and Google voice-control products’ ubiquity, prepare for more voice control in coming years. For example, CES featured LG’s Alexa-enabled TV this year, the ThinQ AI. This TV employs multiple AI learning techniques that innovate how we currently use voice control. For example, “conversational voice recognition” features will enable devices to understand questions and commands more contextually, so users won’t have to repeat themselves. The TV’s Magic Remote, powered by Amazon, helps users set routines and schedule other home devices, all through their televisions! Not to mention, you can instantly change the channel, set alarms and ask questions using just your voice. If any of these trends inspired you as much as they’ve inspired us, you’ve come to the right place. WSC Home Audio and Video keeps up with the latest home innovations to offer premier quality home solutions for our customers. How do you want your home theater to entertain you and your family? Does the new, media-room style design appeal to you, or do you prefer the sleeker, focused look and feel of a dedicated cinema? Either way, you’ll get exactly what you want when creating a captivating media experience. If you have a room that you’re not using and want to convert, or if you’re going to update your current space, we’re here help you explore some possibilities. Contact us online or chat with us below to schedule a no-obligation consultation.